What a Monday this has been. All of my plans for today went out the window due to unforeseen things happening. I think I can sew after I finish this post. I have been trying to get Maker's Monday going but it'll have to take a short break until I get my stuff together. 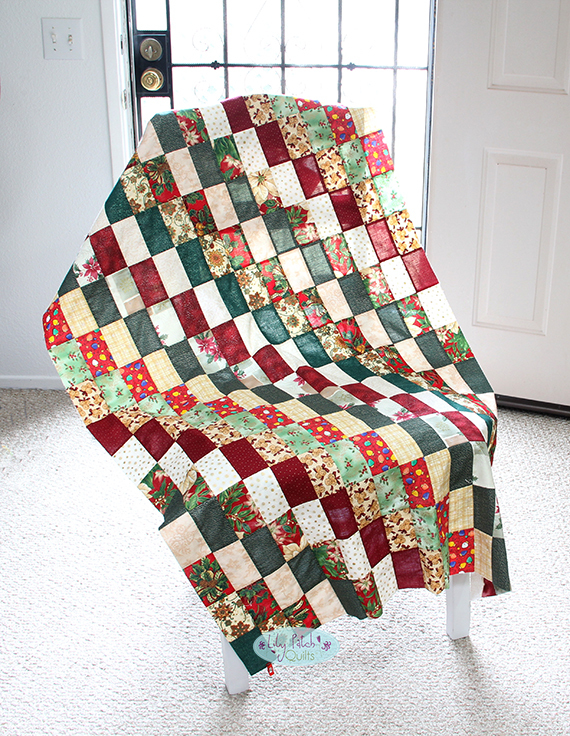 Anywho, I have been following along with Sarah over at Confessions of a Fabric Addict with her Christmas blog hop and Santa's Trip Around the World Quilt Along. As you know in my previous post that I was wanting to make mine bigger and I wasn't thinking about the fabrics I was cutting so it ended up that I didn't have enough to cut the larger strips. 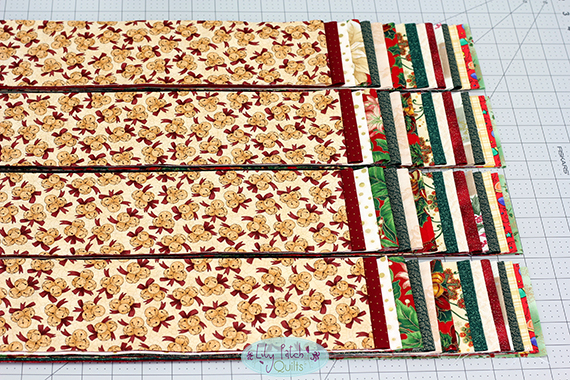 I went ahead and cut the pieced strips into 2.5" inch strips so now my quilt panel looks rectangular. I think I still can make my large quilt happen just as soon as I finish sewing the other panels and lay out the quilt. I am loving how it's turning out though and see my clover clip on the bottom left corner? That's to mark the spot where I split the stripped tube. It's a pretty neat idea all thanks to Sarah. I am still plugging away at the Kona Cotton's scrappy solids quilt. It's coming along slower than planned but the top will get put together shortly. You can still join Sarah for the last couple of days of the hop so head on over to her blog and check out the ladies on the hop. 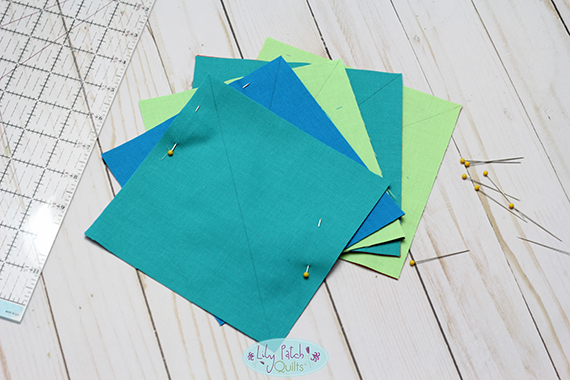 I am pretty sure that Sarah's instructions will not turn out correctly with rectangles rather than squares, so double check this before sewing all the quadrants together. Kim, your quilt is gorgeous! I really like the rectangular blocks and it's a bit unexpected, but that's OK and makes it special! You will cherish this always! I love the fabrics in your STATW quilt. This will make a lovely Christmas quilt for your bed no matter if it is square or rectangle. I know you will make it work. this is a really fun Christmas quilt. I love the effect. thanks for sharing. I LOVE the rectangles! It looks so fantastic! Such pretty fabrics, Kim! I hope it all works out in the end - whatever happens, you'll have a beautiful, unique quilt! Thanks for quilting along with me!